What Day Of The Week Is October 15? 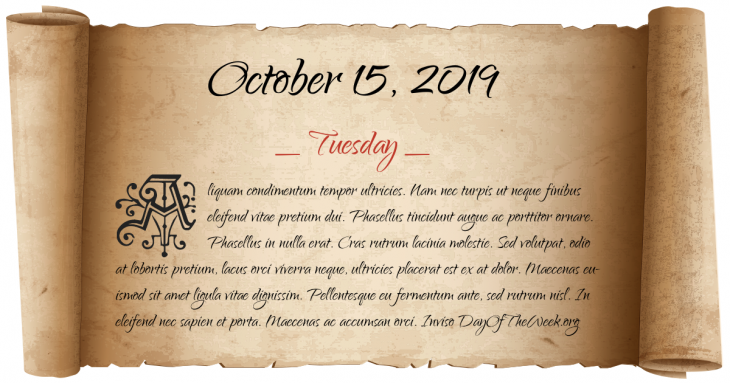 October 15, 2019 is the 288th day of the year 2019 in the Gregorian calendar. There are 77 days remaining until the end of the year. The day of the week is Tuesday. Queen Marie-Antoinette of France is tried and convicted in a swift, pre-determined trial in the Palais de Justice, Paris, and condemned to death the following day. Airship America launched from New Jersey in the first attempt to cross the Atlantic by a powered aircraft. The New York Municipal Airport (later renamed La Guardia Airport) is dedicated. Who were born on October 15?